Version 5.3.0 - macOS 10.12 or later required. Drag and drop folders, PDFs, applications, or URLs into VoodooPad, and they will link up just like on the web. And with powerful search, nothing will be lost or out of reach. Organize your shopping, travel, and home repair by importing coupons, important receipts, & travel documents into VoodooPad. Link to favorite items, preferred stores, hotels, rental companies, and other businesses. Create lists detailing your plans! Keep your research organized and logical by taking advantage of VoodooPad's wiki links, collections, tags, aliases, and powerful search. Import research articles, class notes, and link to websites. Merge and split your information as it grows! Need to share your VoodooPad document? Export it as a PDF, ePub, or even HTML to make your own website. Maybe you want to collaborate with a few friends? Put it on a shared Dropbox folder and edit away. Need VoodooPad on the go? 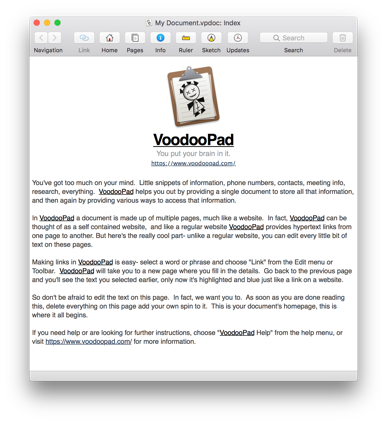 Use VoodooPad for iOS to access your document on the iPhone or iPad. VoodooPad even has a built-in web server to share documents over a local network. With VoodooPad's powerful encryption you can easily organize passwords, usernames, registration information, and accounts. You can encrypt single pages or your entire document.